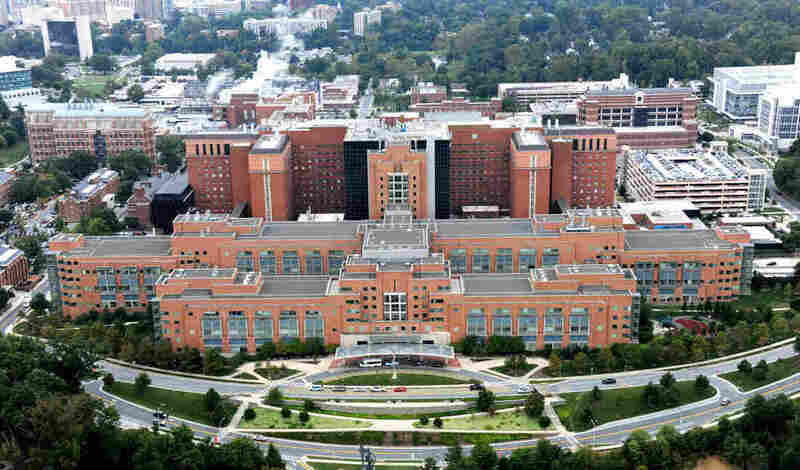 Trump Administration Proposes Big Cuts In Medical Research : Shots - Health News The National Institutes of Health, which funds research in treatments and cures, could lose 20 percent of its budget under the administration's proposal. More money would go for addiction treatment. The National Institutes of Health is based in Bethesda, Md., but the vast majority of its research funding flows to universities around the country. "Reform" of funding for the Centers for Disease and Prevention, which works to prevent, monitor and combat disease outbreaks. The budget mentions a $500 million block grant to states. An additional $500 million for the Department of Health and Human Services to "expand opioid misuse prevention efforts and to increase access to treatment and recovery services to help Americans who are misusing opioids get the help they need." Investment in "mental health activities that are awarded to high-performing entities and focus on high priority areas, such as suicide prevention, serious mental illness, and children's mental health." No specifics are provided. Funding from the National Institutes of Health flows to more than 2,600 institutions around the country and creates more than 313,000 full- and part-time jobs, according to a 2016 study. So it's not obvious how slashing billions from the NIH budget, as the Trump administration proposes, will bring more jobs to America. That $5.8 billion cut represents a 20 percent reduction in the NIH budget, which is about $30 billion. The federal government hands out most of this funding rather than spending it on its own employees, but the budget proposal is not clear on how much of the spending cuts target grants to university scientists. Federal research grant money flows primarily to universities, and they in turn spend billions to buy equipment and services from local companies. Economist Bruce Weinberg and colleagues at Ohio State University looked at what happened to federal research dollars that flowed to nine major Midwestern universities. In 2012, these nine institutions received about $7 billion for research, more than half of which came from the NIH, the National Science Foundation and other funding agencies. Of that, the universities spent almost $1 billion on goods and services from U.S. vendors and subcontractors, the study found. Of that, 16 percent went to vendors in the university's home county, over 16 percent was spent elsewhere in the state, and the balance was spread to companies across the United States. University researchers buy chemicals and other ingredients needed for experiments and purchase laboratory equipment. There are entire industries devoted to supporting biomedical research. "We were surprised by how many were small, niche high-technology companies," Weinberg and his colleagues wrote. "Of course, science funding is not primarily a jobs or economic stimulus program," they added. After all, research is a long-term investment in knowledge and the driving force for economic growth. The budget proposal doesn't include a specific funding figure for the Centers for Disease Control and Prevention, which had a budget of $7 billion in 2016. But the proposed budget says it "reforms" the CDC through a new $500 million block grant that would "increase state flexibility and focus on the leading public health challenges to each state." No additional details are included, but that could mean diverting those funds from the CDC's core budget to provide block grants to individual states. "We are encouraged to see that state health agency priorities, such as flexible funding to meet state and territorial public health needs and the public health Emergency Fund, are in the President's Budget," said Michael Fraser, executive director of the Association of State and Territorial Health Officials, in an email. "Those are things we really do want to see," Fraser continued. "However, the fact is that support for those priorities comes at what looks like a very significant cost to existing programs. The proposed reductions to HHS may have serious negative impacts on both federal and state responses to public health needs and that leaves many of us extremely concerned." The budget also calls for the creation of a new "Federal Emergency Response Fund" that would be designed to "rapidly respond to public health outbreaks," such as Zika. This is an idea that has been gaining support recently, especially in the wake of the Ebola outbreak in West Africa and the emergence of Zika as a threat to pregnant women and their babies. President Obama's emergency funding request to respond to Zika got mired in politics in Congress. The budget doesn't specify how big this new fund would be. The proposed budget is silent on the National Science Foundation, which provides about $7 billion a year in grants to researchers in many fields.